Finding out what the conditions will be like before you set out on a paddling trip is an important part of your kayaking preparations. Knowing the water that you’re heading into is not only essential for your safety but it also allows you to prepare adequately for the conditions. 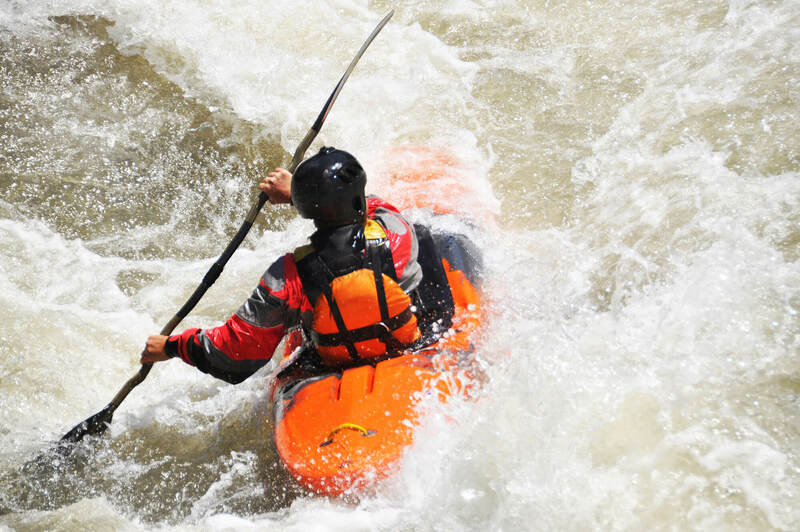 Rapids can be dangerous, but there are different classes to categorize different levels of intensity. So, how intense can the rapids get? And how do you know what the classifications mean? To give you a better understanding of rapids we have put together a guide to ease you through safely. In order to grade the level of current and danger on a river or section of rapids, they are classified on an international grading system, running from Class I (or 1) to Class VI (or 6). You may also find bodies or sections of water rated as Class A. This is to categorize water with no movement, such as a lake. This is effectively still water. This is the lowest grade of rapids, but that doesn’t mean it’s completely safe. This means the water is fast moving with gentler rapids and lighter riffles. Obstructions are usually easy to avoid and self-rescue should be easy. Class I rapids can usually be navigated on a sit-on-top yak or a canoe, as long as you have a little experience and are wearing appropriate safety gear. This is for paddlers who have a little more experience. There are a few more waves and riffles and the flow is fast moving but obstacles and hazards are relatively easy to avoid, with clear channels. Self-rescues are usually possible. It may still be possible for some experienced paddlers to navigate through Class II rapids on a sit-on top or canoe, however, sit-insides would be better utilized in these conditions. These rapids are fast moving, with moderate waves that are more difficult to navigate and would not be suitable for a sit-on-top or an open canoe. Obstacles can be avoided and waves can be paddled by more experienced paddlers who are able to control their vessel in strong currents. Self-rescues can be possible but you may require some assistance. It would be advisable to be paddling in a sit-inside yak for this class. Class IV rapids are more dangerous and difficult to navigate, and should be attempted by paddlers who have experienced boat control. These rapids may require fast maneuvering over larger waves and drops. Self-rescues are difficult and will often require group assistance. These are very difficult and demanding rapids and should only be attempted by serious, expert paddlers. The water could be turbulent and unpredictable and it’s advisable to scout it first before attempting to paddle it. The conditions will be dangerous for swimming and a self-rescue will be very difficult, even for expert paddlers. It is vital to have practiced and be experienced in rescue skills before taking on Class V rapids. This category includes extremely dangerous and unpredictable rapids, which should only be attempted by expert teams, as errors in paddling can be fatal. They might often include significant waterfalls. Class VI rapids are rarely paddled and water levels and conditions would need to be examined thoroughly prior to attempting to run these violent rapids. What Rapids Can I Tackle? In order to decide what category of rapids you could tackle you would need to assess your own skill levels, not just as a paddler but as a swimmer. Before you attempt any rapids, you should be certain that you would be able to swim it or run it safely. You should be confident swimming underwater if needs be and you should also be able to successfully complete an Eskimo roll and a wet exit. For higher level rapids you should have complete control over your vessel, with the ability to stop and reach the shore. Before you attempt to run any rapids, make sure you know what their classification is. Your local canoe or kayak livery can usually help you with this, as well as give you local advice on weather conditions or other hazards that may have affected the river or the run. You should also remember that many rivers will have a combination of rapids, so you might be paddling along a relatively easy Class I river before it eventually turns into a Class III or IV. So make sure you’ve researched the river and the stretches that you plan on paddling, to avoid coming face to face with rapids you’re not prepared for. Water levels can significantly affect the difficulty of the run, with high water often making the flow faster and more powerful. Heavy rainfall or flooding can make rivers especially dangerous, not just because of the increased water power but also the amount of debris that might be in there. This means that even rivers that were calm or easy to paddle can become fast-flowing, with dangerous currents. It’s a good idea to inspect the river beforehand and check with local experts if you’re unsure. Dams can also affect the level of water and the current, so make sure you know the water release times of the local dam before you head out to paddle and be sure to stay away from the hydraulics, as you could quickly become trapped. Dams are responsible for more than 8% of river deaths, so exercise extreme caution. What Gear Do I Need For Rapids? A PFD is essential when running rapids and should be worn at all times, regardless of the classification of the rapids, as it can save your life. Wearing a helmet will give you an extra level of protection, particularly on rapids. You’re more likely to suffer a head injury on whitewater than on flat water and you’re more likely to tip over, therefore it’s essential that you’re wearing a well-fitting helmet. If you’re paddling in cold water, you should be wearing appropriate clothing, such as a wetsuit or drysuit, and nothing bulky that might hinder your ability to swim out. You should be dressed for the conditions of the water and not the weather. Having spare dry clothing with you is a good idea. This one is particularly when you start hitting Class IV and higher waters. Because of the conditions of rapids, you should have enough paddles to allow to you run the rapids and get back to shore safely in the event that your original paddle breaks or you lose it. You're probably going to need a 4-piece paddle, as you need to store it within your kayak cockpit. Having ropes on your yak is important, as it will allow you to both keep a hold of your yak if you happen to fall out. A throw rope will come in particularly handy if and when anyone needs to be rescued. Attach a safety whistle to a lanyard and attach it to your PFD. This can be a vital tool for alerting others to your location if you need to be rescued. A whistle can often be easier to hear than shouting over the raging waters, and you’ll probably find you use less energy blowing a whistle than you would yelling for help. Attempting to run rapids on your own is not advisable. Because of the unpredictable nature of rapids and the conditions, paddling on your own can be dangerous. The American Whitewater organization recommends that you have a minimum of three people in your party or at least two vessels. What Safety Procedures Do I Need To Know? If you’re planning on hitting the whitewater, you should already know how to escape from your yak. If you’re in a sit-inside you will need to know how to perform an Eskimo roll, which will allow you to flip yourself back upright after you’ve flipped over. You should also know how to exit your kayak safely and quickly. If you’re in a sit-inside and wearing a spray skirt you should be confident in performing a wet exit. Swimming - Be A Good One! Ok, so you may not be Michael Phelps, BUT...you might find yourself in a dangerous situation and need to let go of your vessel in order to have a better chance at survival. If you’re in shallower waters with less hazards, make sure you lie on your back and keep your feet up in front of you, facing the direction of the flow. However, this might not work in deep or extreme rapids. In this case you should swim strongly and quickly towards the shore, if you can, or anywhere that you’re able to stabilize yourself while you wait for a rescue. Before you head out to the rapids, it can be a good idea to know basic first aid and CPR. This can prove to be a vital skill in the event of an accident and could save someone’s life. Now that you’ve had a deeper look into the differences between the classifications of rapids and what they mean, you should be able to work out the types of whitewater that will suit your abilities and skill levels. You should also remember that safety should be your number one priority and that you shouldn’t attempt any rapids that are outwith your experience level or comfort zone. Just remember to keep in mind that the weather and natural events can affect the intensity of rivers, which can make them unpredictable, so make sure you’ve researched the conditions prior to heading out. If you’ve enjoyed reading our guide, please share it with your fellow whitewater paddlers and remember, if you have any questions or comments, be sure to let us know.